There is a comfortably old-fashioned feel to this fine recital by Nicholas Phan and Myra Huang. Phan, an American tenor, has recorded Elizabethan lute songs, Stravinsky, Bach, and Britten, among others. The current program features eighteen German narrative lieder from the 19th century, when performing a story through song was an important form of entertainment. Phan writes that his approach to lieder was influenced by a program which sent him to Ohio primary schools, trying to hold the attention of young audiences as he sang Britten and Schumann. 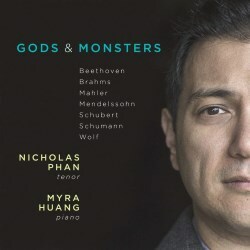 He learned that a song must be presented like “telling a tall tale around a campfire.” Phan does not carry this lesson to the point of lurid exaggeration, but he and pianist Myra Huang are attentive to details that might pass unnoticed in blander performances. Phan’s rather resolute, often plangent voice is well suited to this celebration of story-telling in German romanticism. Phan and Huang wink to the audience as they lead us through this old-school entertainment, organizing their program into four sections. “Mount Olympus” consists of four Schubert lieder dealing with gods, ranging from the sensually sung “Ganymede,” to the unsettled world of “Atys,” where the youth envisions Cybele riding across the sky in a chariot pulled by lions. The happy wanderer of “Die Musensohn” brings the section to a smiling conclusion. “Knights and Kings” extends the storybook theme with Schubert, Brahms, Mahler, and Beethoven. Schubert’s “Der Sänger” showcases Phan’s ardently imploring light high tenor. The sunlit mood darkens with Brahms’ setting of an unhappy reunion of two sisters. Two Mahler songs include the even darker “Wo is die schönen trompeten blasen.” Phan concludes with Beethoven’s setting of Goethe’s sardonic song of the flea. “Things that Go Bump in the Night” opens with Schubert’s “Der Zwerg.” This is not the scariest version available, but it is eerie enough, while also being quite stirring. Schumann’s “Waldesgesprach” is a spooky tale of Rhineland doom, delivered with gravity. Hugo Wolf’s “Der Feuerreiter” may be a little too hysterical, although this story of an arsonist certainly calls for alarm. In contrast, Mendelssohn’s witches in “Hexenlied” seem gentle in comparison. “Fairy Tales” brings the program home with gentler songs, beginning with Schumann’s Der Sandmann. Three Wolf songs include the fiercely sung and unsettling Der Rattenfinger, and Elfenlied, a wonderful portrait of an ineffectual old elf. A “Postlude” offers another Sandman, this one by Brahms, which is a more soothing lullaby than Schumann’s scurrying creature. Any listener drawn to this kiss to German romanticism will have ideas for additional songs that might have been included. Schubert’s “Erlkonig” is so often recorded that we don’t really miss it, but what of Carl Loewe’s Erlkonig, or any of his wonderful songs of dancing elves, prancing knights, or distressed ladies? You will have your own favorites, which is not to criticize this imaginative and lovingly constructed program, but rather to hope for a second disc. Myra Huang’s contribution cannot be faulted for reticence, and is notable for precision and a sense of purpose closely shared with Phan. Her crisp articulation in joyous “Musensohn” is only one example of a fine musical partnership. Avie has provided excellent sound for this very satisfying recital.